One of the biggest challenges of coaching comes in coaching athletes who are different from us. Most coaches approach the sport in the manner that worked for them as athletes. This is instinctive and comfortable, but without expanding to accommodate athletes with different learning styles it is also ultimately limited. The best coaches find ways to reach and teach athletes with varied learning styles. Verbal instruction, the coach telling the athlete what to do and hopefully how to do it, is the most common form of coaching. This can be incredibly effective or miss the mark depending on the quality of instruction and the receptiveness of the athlete. The athlete needs to both be open to receiving instruction and also capable of digesting it and turning it into action. Many athletes are initially reluctant to change because change is scary. Coaches must first help them overcome this fear before there can be change and with change hopefully improvement. Even with fearless athletes, however, not all can adequately process verbal instruction and turn it into changed behavior in the boat. Some athletes respond better to visual instruction. This can be as simple as the coach or another athlete demonstrating the desired behavior or showing video of good rowing. A picture, accompanied by spoken instruction on what to look for, helps many athletes. 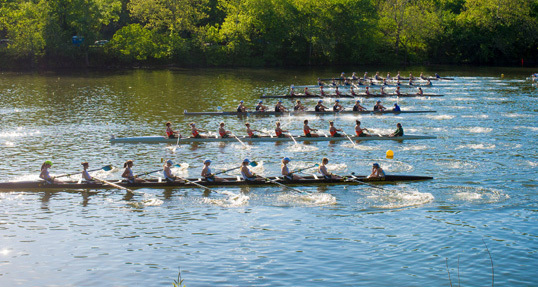 Coaches most frequently use video to highlight their rowers’ flaws. Doing this alone typically is not as useful as showing positive examples. “Don’t do that” doesn’t help nearly as much as “do this.” Visual learners can often take what they see and put it into practice. Other athletes respond well when they can feel a change. Coaches can succeed by creating a scenario whereby the athlete can feel the difference between rowing well and not rowing well. This could involve making the load heavier so athletes can more easily feel what they’re doing. It can also be accomplished by the coach using his or her hands or some other item to indicate exactly where an athlete should experience the connection or hang. Much of our sport is based in academic institutions. Our athletes are well-practiced in reading for understanding. Taking advantage of this, coaches can provide or post a written description of the rowing stroke as they want to see it performed. Athletes can then read, review, and digest this at their own pace out of the shell. Sometimes just the relative safety of being on land and not needing to row or contribute to the boat while thinking about the stroke is enough to improve understanding. Ultimately most athletes learn using some combination of various learning styles. They may acquire most of their learning in one particular fashion but gains can still be made exposing them to other methods. Even with athletes who get it using your preferred method, it is worthwhile exposing them to other stimuli. You may be surprised by the unexpected improvement. Regardless of the athlete’s dominant learning style everyone learns more in the long term when they’re happy and enjoying themselves. We all sustain our commitment for longer when we’re having fun. Enjoy this video recap of the 2016 Royal Canadian Henley Regatta.